There’s traditional archery, then there’s primitive archery. 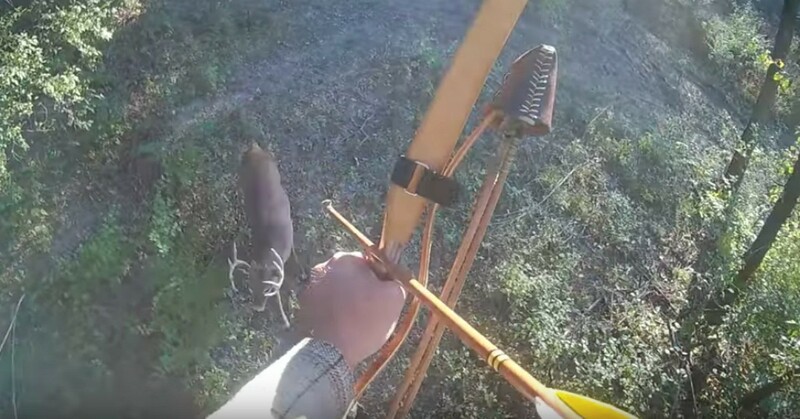 Check out this in-your-face video that captures a close encounter with a self-made bow, wooden arrow and stone broadhead. We’ve highlighted primitive gear such as a self-made bow in the past, but this video takes it to the next level by showcasing such archery equipment in the field during a whitetail bowhunt. Below is a 6.5-minute clip posted on Oct. 22, 2018, by someone with the online moniker Sticks, Stones & Strings. At the time this article was written, the YouTube channel had only 38 subscribers, and this video was the fifth. The host’s first video was posted 4 months ago. Viewing tip: Listen to what the host says at the beginning, but then you might want to fast-forward to the 2:20 mark, which is when the buck first appears in the background. Can you see him? The big whitetail isn’t visible for long, so you might want to fast-forward again to the 3:45 mark; that’s when things get very interesting in a hurry. As someone who has hunted with traditional gear for decades (as well as compounds and crossbows), I must admit I was a bit surprised when the host released his arrow. Sure, the big buck is close enough, but the quartering-toward angle is a problem in my opinion; I’m also not a fan of nearly straight-down shots (impossible to hit both lungs). You can see in the video that the stone broadhead and wooden arrow doesn’t penetrate deeply, but the fact remains that the gear gets the job done in the end. Congrats to Sticks, Stones & Strings for a fantastic buck; thanks for sharing the video with the world on YouTube, and nice job filming your adventure with the Lidcam+ camera. We’ll be interested to see more of your videos highlighting primitive gear in the future.